Linear axes with rack and pinion transmission. Rolling on trapezoidal or recirculating ball guides. High loads and precision positioning. Can be equipped with multiple independent carriages. Linear axis with belt drive or screw drive. Rolling trapezoidal, round or recirculating ball guides. Reduced maintenance, silent. Covers resist contamination. Vertical axes with belt transmission. It includes axes with pneumatic counter balance. The pneumatic cylinder is integrated inside the section, which also contains cable conduit. It requires small geared motors, it offers high performances, resulting in cost and energy savings. 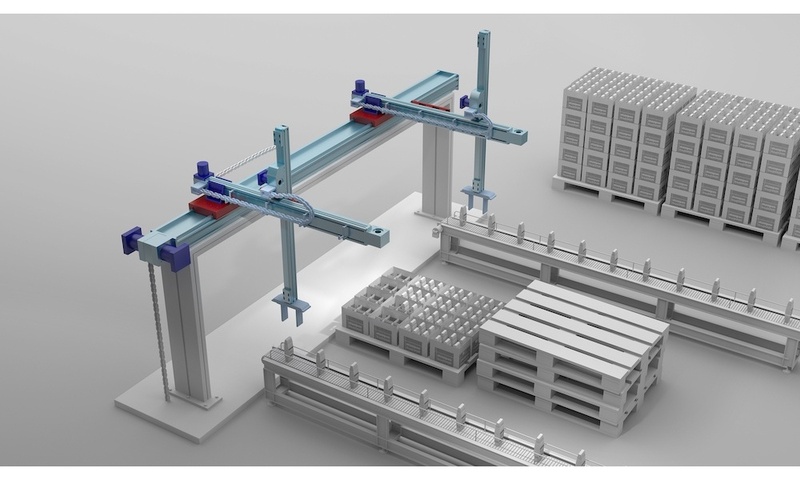 Modular handling system consisting of aircraft aluminum alloy guides with high mechanical features and hard coast anodized surface (deep, hard anodisation) and wheel-based rolling blocks. Designed to protect the wheels, it has a small cross-section and is available in various configurations depending on loads and distance between the various supports. Can be integrated with structural sections and a wide range of accessories. Prismatic steel guides hardened and ground with high carbon content provides for easy assembly and low maintenance requirements. Extremely adaptable, they allow for applications with good accuracy in environments with process contamination. TH linear actuators are rigid and compact, ball screw driven linear units, that enable high positioning accuracy and repeatability in all process phases. With optimal performance assured, TH actuators have a repeatability within 5 μm. carriage versions to meet different load requirements. The TH linear units also feature safe rail and screw lubrication through a dedicated channel for each component. The incredibly compact structure of the TH actuator makes it the ideal solution for applications where space is limited.